At G-20 And At Home, A Test For Saudi's Crown Prince: Can He Survive Khashoggi Fallout? The summit marks a test of how far world leaders will seek to distance themselves from Crown Prince Mohammed bin Salman in the wake of the killing of journalist Jamal Khashoggi. 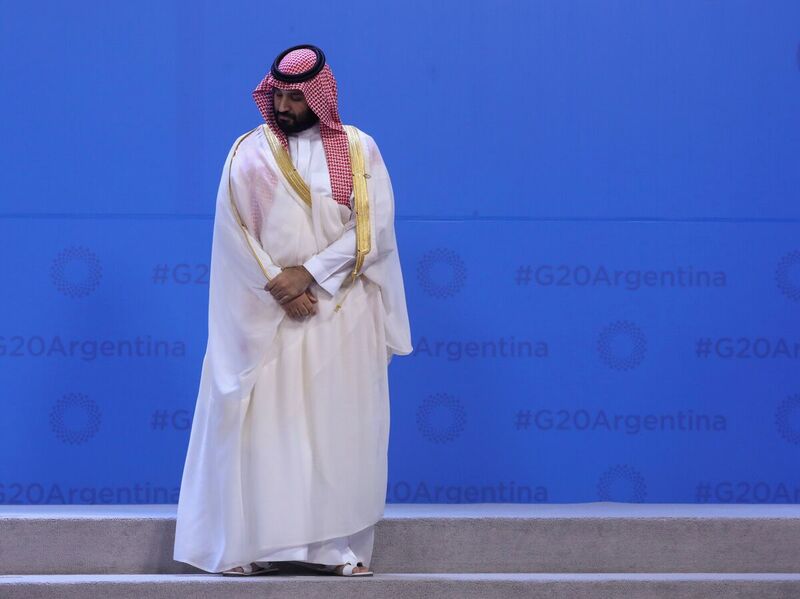 Crown Prince Mohammed bin Salman during the G-20 summit on Nov. 30, 2018 in Buenos Aires. The summit marks a test of the extent to which world leaders will seek to distance themselves from him. The summit marks an important test of how far world leaders will seek to distance themselves from the crown prince after Khashoggi was killed at the Saudi consulate in Istanbul in early October. The Saudi government has denied that the crown prince played any role in Khashoggi's death, but the CIA has concluded that he in fact ordered the killing. 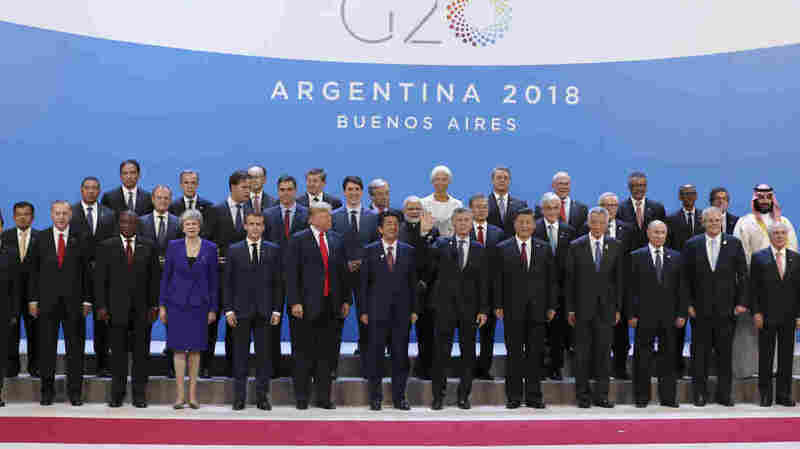 The controversy surrounding the crown prince was evident on Friday, when he was sidelined for the official "family photo" of world leaders at the summit, and then exited the stage without shaking hands or speaking with other leaders. President Trump "exchanged pleasantries" with the crown prince, according to a senior White House official, but there was no formal meeting scheduled between the two leaders. 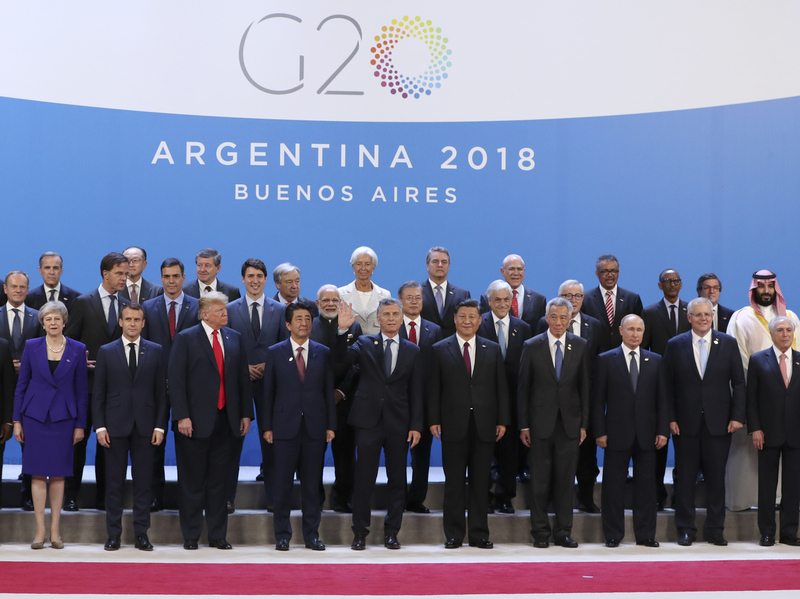 Crown Prince Mohammed bin Salman appears on the sideline of the official "family photo" of world leaders taken on Nov. 30, 2018 at the G-20 summit. For now, the crown prince seems to have survived the fallout, but the iron-clad lock he once seemed to have on becoming Saudi Arabia's next king is no longer a sure thing. Saudi Arabia's sprawling royal family decides who runs the kingdom. It's inner workings are opaque, though, so outside observers have to look for signals or past experiences to gauge how Crown Prince Mohammed is faring in the wake of Khashoggi's death. "He is, I think, on thinner ice than he would have expected to be ... and has alienated many senior members of the royal family," says Robert Jordan, the U.S. ambassador to Saudi Arabia from 2001 to 2003. Jordan says the crown prince's association with the Khashoggi killing comes on top of a series of questionable — and high-profile – moves, including the detention of Saudi royals and prominent businessmen at the Ritz-Carlton in Riyadh, "the very ill advised war in Yemen, the ill-advised blockade of Qatar, the incarceration of the prime minister of Lebanon, the list can go on and on." "All of these are projects owned by — personally — by the crown prince and they've been failures," says Jordan. Rachel Bronson, the author of Thicker Than Oil: America's Uneasy Partnership with Saudi Arabia, says the crown prince's missteps have hurt Saudi Arabia's reputation, which has no doubt upset many in the royal family. "They have spent decades trying to build themselves up as a respectable international actor, and the crown prince has just destroyed that with one operation," says Bronson. Bronson says the crown prince has clearly shown he's not ready for the power his father, the king, has given him, and that key members of the royal family are undoubtedly talking about finding a replacement to the crown prince. "Where I would put money on is that these conversations are happening and being whispered and they're trying to figure out if they can conceivably build an alternative and they could get ... powerful members of the family onboard with that," she says. One alternative to Crown Prince Mohammed that keeps cropping up is King Salman's brother, Prince Ahmed bin Abdulaziz, who has returned to Saudi Arabia from living in self-exile in London. Chas Freeman, who served as U.S. ambassador to Saudi Arabia in the early 90s, calls Prince Ahmed a "very quiet, unassuming, careful person" — a sharp contrast from the personality of the hard-charging crown prince. Some royals may be looking to Prince Ahmed, a former deputy minister of the interior from 1975 to 2012, to replace the crown prince, but the aging King Salman is the one person who can choose the heir to the throne. Freeman believes the king will continue to back the crown prince, who is commonly referred to as MBS. "The problem for him comes when his father dies or abdicates and he wants to become king because ... MBS must be acclaimed by the family, positively endorsed within it and with an oath of loyalty," Freeman says. "And he's not assured of that now." Freeman says that in the past, the royal family operated by consensus so it could unite and remove an heir to the throne. But he says Crown Prince Mohammed has managed to consolidate power in the kingdom — he controls the intelligence services, the military and the police. "The political change that Mohammed bin Salman ... engineered replaced the system which had literally dozens of power centers holding up the entire state," Freeman says, comparing it to a table with multiple legs. Now, Freeman says, "It's a pedestal table — one push and you don't know which direction it's going to go." The crown prince is also working to repair his image at home and abroad. He clearly feels safe enough in his position to travel abroad, but he was recently met by protesters in Tunisia. Some held up placards, calling him a murderer. A giant banner hung from the Tunisian National Journalist Syndicate depicting the crown prince holding a chain saw - a nod to the bone saw that allegedly was used to dismember Jamal Khashoggi.